If you suffer from a sensitivity to pet dander, then it’s best not to bring a furry friend into your home. Sweet as they may be, you will be living in ongoing discomfort, which won’t make a happy home for anyone, including the innocent animal you will likely come to resent. If you feel your home just isn’t a home without an animal companion, there are several breeds of dogs and cats that are much less likely to cause allergy troubles. If pollens, ragweed, or other outdoor allergens are causing trouble inside of your home, you can take preventative measures to keep these allergens out of your home. 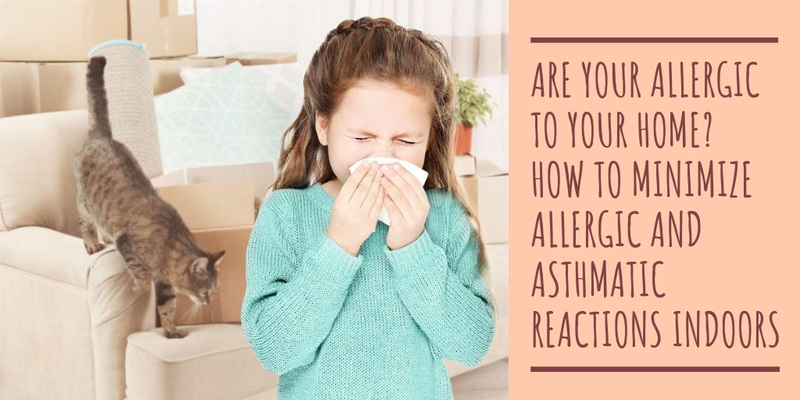 A breath of fresh air is always nice, unless that outdoor breeze brings allergens into your home. Keep windows closed during the afternoon and early evening, when flowers are open and pollen spreads most easily. There is less pollen in the air at night, so you may be able to sleep with the windows open if you feel you simply must air out your home. Be sure you’re using the right air filter with your home’s central air system. Change filters regularly and buy filters that are designed to keep your home allergen free. A higher cost at the cash register may help you from paying a higher cost of discomfort in the home. There is just no way to make sure that nothing gets into your home, and dust – as well as dust mites – are inevitable. Because of this, if you are an allergy sufferer, it’s time to break out the french maid costume and get to cleaning! What? No costume? That’s okay, it’s optional. When you dust, you’ll just make your allergic reactions worse if you do it the wrong way. Instead of just pushing dust around, be sure to use a damp cloth or one that is treated to actually pick up the dust when you wipe. Dust often and well. Carpet vacuuming should be done at least once a week as well, but it has the same caveat as dusting: you have to do it right. Use a vacuum with a HEPA filter to keep from recycling your dust right back into the air and into your sinuses. If you can, it’s best to just get rid of carpets all together. Flat floors are much less hospitable to allergens. It’s important to keep up with your never ending cycle of laundry, especially your bed linens. You spend plenty of time there, and dust mites are very snuggly little things. Wash your sheets and blankets on hot, put them in the dryer on high, and encase mattresses and pillows in allergen proof covers. Check out the cleaning products you use during all of these activities. Harsh chemicals in cleaners can be their own allergens. The best solution here is to look for good, green cleaning solutions that work best for you and your home.